Today’s my fourth day in Athens but things are still exciting. In the morning, I decided to see the Central Market and maybe try out some tripe soup recommended on TripAdvisor. I never saw the tripe soup stall but I did enter the market’s meat, fish and vegetable zone. There were so much seafood on display. My heart longed for the huge squids lying on their bed of ice. Sadly, I do not have a kitchen I can cook the squids. 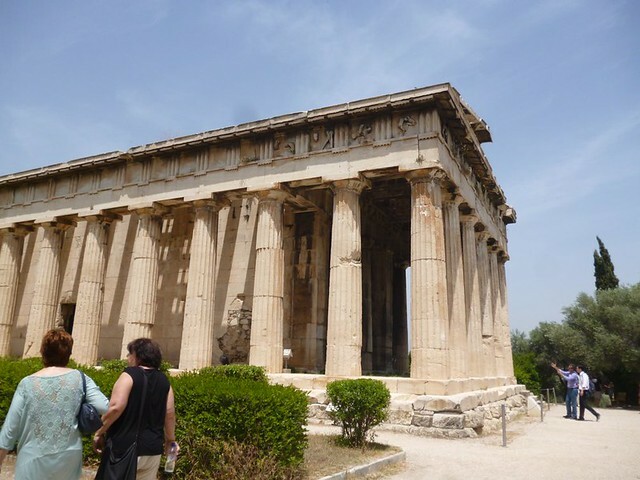 Next on my To-Do list was the Temple of Zeus. However, I wandered to the wrong place and visited an ancient public bath. The public bath was housed in a small house. The inside of the place was cool, a great escape from the heat outside. 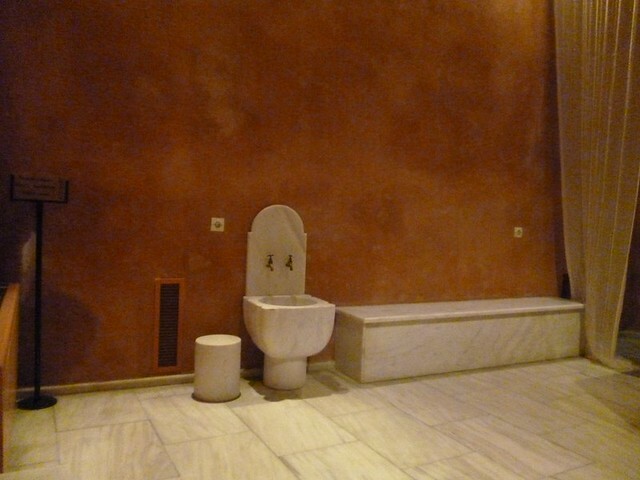 There wasn’t any water around but they showed some marble washbasins and benches. I was disappointed to see that the women’s section was much smaller than the men’s. Just down the road from the bath is the Ancient Agora. My tickets to the Acropolis covered this sight as well so I dropped by. Turns out I didn’t need my ticket. It was International Museum Day and it was free entry to the sight. At the Ancient Agora, I followed Rick Steve’s brilliant walking tour. Halfway during my tour, an older American couple followed my route with their audio tour on speaker. It was so annoying having their audio tour on so I waited until they left. The Ancient Agora was where the ancient people met for town meetings, theaters and so on. Most of the buildings were turned to rubble so having the audio tour helped make more sense of the place. I tried to look for the Temple of Aphrodite Urania but couldn’t find it. It was past lunch time when I finished seeing the Ancient Agora. 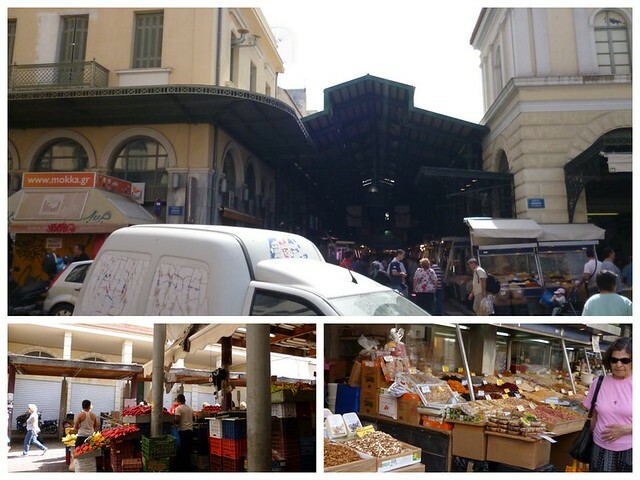 I head back to the Central Market area where I had spotted souvlaki shops. 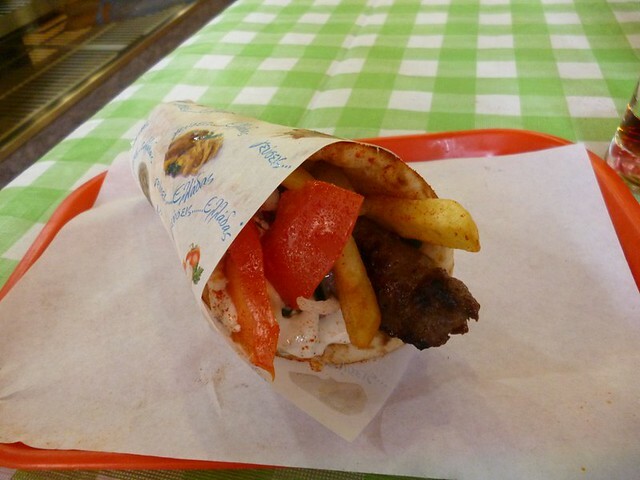 For lunch, I had a delicious meal of kebab in pita with a cold Coca Cola for only 3.30 euro. The pita bread was still piping hot when it came to me but I wolfed it down rather quickly. The afternoon sun was too punishing so I head back to the hotel for a quick shower. Despite having coke for lunch, I finished a tin of carbonated lemon to cool down. I think it was worth the calories. When it was past 5pm, I headed out again. This time, I needed to find the bus station where my Istanbul-bound bus will leave next week. The directions given by the travel agency where I bought my bus ticket was fuzzy. Even with the help of the Internet, I couldn’t figure out exactly where it was. I followed the advice of the travel agent and took bus A15. Luckily, Google Maps helped me narrow down the area and I spotted the bus station. Since I had nothing planned, I continued my bus ride until its last stop. 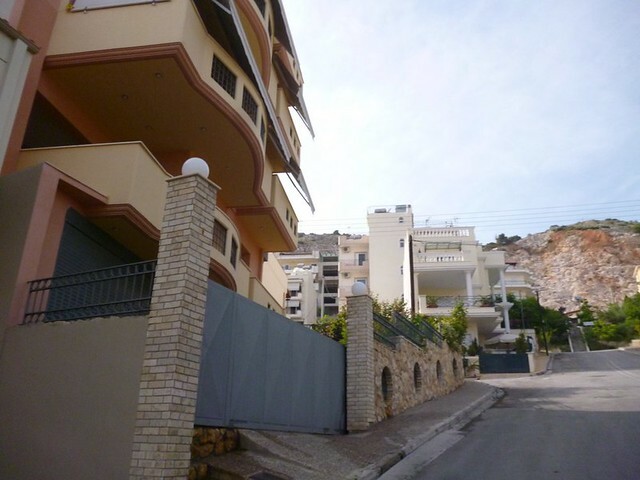 The bus stopped at a residential neighborhood on a very steep hill. I tried walking up but gave up before the last staircase. Even standing on the pavement made me feel imbalanced. While I walked down back to the bus stop, I passed by a family of a grandfather, a father and two twin toddlers. They were playing baby football (the ball is kicked gently to the kids). The boys followed the father’s cheer “GOAL” when the ball reached their feet. It was so adorable. The bus back to town was uneventful. We passed many shops that were closed. Maybe it’s a Saturday so everyone’s out. The bus eventually ended near where I boarded. Luckily for me, that’s very near my hotel. At Carrefour, I did a little shopping for feta cheese (Greek cheese is so yummy! ), milk (equally yummy), body lotion (I hadn’t tasted it yet) and a big bottle of lemon soda. The rest of the evening was spent on the internet. Good night!